In case you do not have a lot of time at hand, but you want to find out what the best can openers for seniors are, we are here to help. We have done some research on the market and went through the most popular senior can opener reviews to help us find what product provides high-quality and a fair value for money. We concluded that the Hamilton Beach 76607 is an item worth taking into consideration. The device is very easy and comfortable to use, especially for people who have to deal with arthritis or do not have enough strength in their hands, as the handling requires less grip force. The cutting is done along the side of the can and not at the top, so you can forget about scratching your fingers on sharp edges. In case you cannot find the Hamilton Beach 76607 for sale, or if you are looking for something else, we suggest Cuisinart’s CCO-50BKN as the second best option. If you are looking for a can opener which is stylish, convenient, and well-made, but also suitable for a senior with arthritis, this is the perfect choice. It functions with a single touch, which makes the can opening process much easier. This model has a high-quality engineered motor system and a power cut blade, which can be used on any standard size can, without too much effort. A few customers reported that after having this product for a few years, they started noticing metal shavings on the counter after the can opener was used. This is a quality can opener which is suitable for old, fragile fingers, as well. For a senior with arthritis-related issues, opening cans can be a painful task. This heavyweight, extra-tall model comes to offer support in this sense with its SuperCut patented technology. And not only does it open cans effortlessly, but you can also use it to sharpen knives. The removable cutting unit makes it very easy to clean and maintain. This product offers durable performance. There were cases where the can was opened only partly, and then the opener would pause, as reported by a series of customers. A can opener that speaks to the needs of seniors that have arthritis. 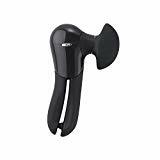 Featuring a non-slip, easy to turn side-wind handle, this can opener is gentle on fragile fingers dealing with arthritis. As it cuts on the side of the container, below the tip, the opener does not leave any sharp edges behind. The cutting wheel is sharp, made of hardened stainless steel and remains clean, as it does not touch the content from the can. Also, it is very simple to use. The opener might not get a grip on the can if not handled correctly, and there were a few mentions made about this aspect. This product is easy to use, and does not leave any sharp edges on the can. If you want to get information about good can openers for the elderly it is essential to do some research. There are a lot of products out there, so comparing all the available items is a complicated and time-consuming process. We wanted to come to your assistance and as such, we’ve selected a few top-rated products for you to look at. The Hamilton Beach can opener provides an effective and safe way to open any can. With a simple pushdown movement, both pop-top and regular cans can be opened in seconds. The main feature of this can opener is that the blade is designed to cut along the side and not at the top of the can, considerably reducing the risks of the user cutting his or her fingers in any sharp edges. The fact that the lid remains on after it has been cut prevents any splashing of liquid or sauce from the container. The lever is very easy to use, as the handling requires little grip strength, by holding it down until the blade makes a complete rotation around the can. With its chrome and black design, this item should fit in with other kitchen appliances from any home. It can also be one of those perfect gifts for grandparents. Cuisinart’s can opener is a stylish, convenient and firm device. Regarding its design, the item features elegant contours and comes with attractive chrome accents. To offer an efficient and effortless operation, the opener functions with a single-touch. This product features a quality engineered motor system and a power cut blade. You can use this device on any standard size can. The manufacturer made things easy when it comes to cleaning the device, as the magnetic lid holder and the power cut blade are connected to the removable activation lever. Based on customer reviews, this item is ideal for seniors with arthritis, as it is very simple to operate. The fact that it is lightweight makes it easy to move around, and also to clean it. Another aspect mentioned in the reviews is that the price is a reasonable one. This brand’s extra-tall, heavyweight can opener can carry some of the tasks while the owner is preparing meals. The tool is perfect for cans and even sharpening knives, and it speaks to the needs of seniors with arthritis-related issues, as it takes a minimal effort to use it. The SureCut patented technology opens cans easily, each time. Its cutting unit is removable, therefore very easy to clean, and maintain. The metal cutting system provides long-lasting performance for opening large-sized cans and shuts off automatically for a hands-free action. Besides being a trustworthy can opener with numerous positive reviews, this product has been designed for people who do not have enough strength in their hands, and especially for people with arthritis. Many of the reviews are actually written by such persons, who praise the product for being so efficient and helpful in the kitchen. Having to take off the top from a can that was just opened might sometimes be a difficult task, since you’re trying to dodge all the sharp edges. OXO’s can opener does not leave this issue behind, as it cuts on the side of the container, below the tip. The side-wind handle features a non-slip grip, and it is simple to turn. Sharp, made from hardened stainless steel, the cutting wheel stays clean, because it does not touch the content of the can. In just a few easy steps, you can open any can effortlessly. The opener can be used on any size of container. Once you position the tool against the container, all you have to do is to rotate the knob clockwise, and as you feel a decrease in the resistance, make a turn the other way to release the lid. The can opener offered by Black+Decker features a power pierce cutter, which removes can tops very fast. However, this is not the only purpose of the tool, as it also comes with a knife sharpener, a bottle opener, and a bag cutter function. Besides being a multi-purpose tool, the design was thought smartly, by offering the option to attach it to the underside of cabinets, thus saving the space on your countertop. All these features are covered by a swing-open door, which provides this item a smooth look. In addition, the power cord can be stored in the back of the device, allowing you to use the precise length you need without generating clutter. Another feature that this smart, good-looking can opener comes with is the auto shutoff function, which means that the device shuts off when you are not using it. Aicok’s product is described as a multifunctional kitchen companion, featuring an electric can opener, a bottle opener, and a knife sharpener. The appliance has a dishwasher-safe cutting accessory, making it a convenient tool in your kitchen. Regarding security, this device comes with a side-cutting system, which ensures safety while using it, and an automatic shut-off function, when not in use. The appliance is easy to operate. What you need to do is lift up the handle, adjust the container between the blade and the gear, press down the stem and you have an opened can. Being high, the device can be used for all standard-size cans. The silver, elegant design makes it suitable for any kitchen decor. The built-in cord storage is easy to arrange. You might want to know that this product comes with a two-year warranty. What the Stress Less model proposes is an essential must-have tool for anyone with reduced hand strength. It is an efficient, easy to use, and safe can opener. Also, it is very durable. The rotating cranking stem offers increased leverage, with only half effort being required. The cutting mechanism cuts on the side of the can, never touching the content, and it leaves smooth, safe edges. This makes removing the lid risk-free of danger to your fingers. The Stress Less line manufactured by Trudeau allows you to get the most out of your kitchen items with minimal effort. Reviews for this item are on positive notes, many people with arthritis or other issues with hands strength, praise this product, stating that it is very easy to use, reliable, and sturdy. In case you are searching for retired teachers gifts, a good can opener is an excellent option. However, if you are going for this alternative, why not complete the present with an open ring as well? One of the available items is the Jokari Deluxe ring pull opener with an attached jar opener. With this type of devices, you can forget about broken nails. The device is designed for those who have little strength in their hands or who are dealing with arthritis, as well. Constructed with a non-slip grip handle, it adds a lot of comfort when in use. This open ring pulls can lids and breaks seals on jarred lids with minimal effort. This product comes with a lot of positive reviews, customers stating that this is a must-have item in any kitchen. Finding the best can openers for arthritis and offering one as a gift to a senior suffering from this condition, is just as good as providing a great wheelchair cushion for someone who has to use a wheelchair. For someone who has to deal with arthritis, trying to open a can is very painful. Squeezing and twisting movements are almost impossible for inflamed, stiff joints. That is why finding the best jar and can openers for seniors is essential, and getting one for such a person can make his or her life much more comfortable. Before you decide on getting a can opener, you should know that there are multiple options on the market. There are manual openers, which look similar to a pair of scissors. The handling is done through tightly squeezing the turning handle. This type of device is almost impossible to use for a person suffering from arthritis. Electric can openers work by pressing a lever arm with a blade into the can’s lid. A motor turns the container around until it makes a complete rotation, cutting the top. The issue for arthritic hands is holding the lever arm long enough, so it is essential to find a model with a strong blade to help with the initial puncture. There are also handled automatic electric can openers, which usually work with batteries. They are smaller in size, and they lock on the edge of the can. Then they move around the container by a push of a button. The issue is that there are a lot of cheap versions, so make sure you read the reviews to find a genuine product. The pull can pop top openers are helpful to open cans with pull-top lids. These are very helpful for arthritic hands, as it is challenging to get the finger through the pull hole without pain. Finding an appropriate can opener for a person with arthritic hands is like getting an excellent walking stick for someone who needs assistance to walk. Besides ease of use, another aspect you should take into consideration is safety. Arthritic hands require a lot of attention, so we recommend staying away from devices which require firm gripping or squeezing. Manual crank wheels should be a no-go from the start. Also, can openers that have small buttons or levers that need holding down for longer periods, are not recommended, as it can be very painful for arthritic hands. Devices which require strength to puncture the lid are not suitable as well. When you are searching for the best jar openers for seniors, the first thing you should look at is a smooth edge can opener design. The cut must be made in the lid of the can, without leaving sharp edges which can cut or scratch. This is usually one of the biggest concerns when it comes to can openers as a cut from a metal can be really dangerous and painful. Another aspect you should look at is a low pressure, ergonomic handle. This feature is essential for people with arthritis. Otherwise, they can cause damage to the hand, fingers, and wrists. To sum up, you should look for an opener whose cuts have smooth edges and that comes equipped with easy-to-use features. The fewer the movements and the less amount of effort, the better and safer everything might be for arthritic hands. When it comes to searching for suitable grandma gifts or granddad gifts you should go for high-quality products. A can opener is an excellent gift option, to help them with the jar opening process. Cheap can openers for seniors are not necessarily low on quality, but the price should not be your first concern. In order to make sure you are not paying more for an unsuitable product, you should also carefully go through the customer reviews. For people suffering from arthritis, using an improper tool can cause serious damage to the hands and wrists.